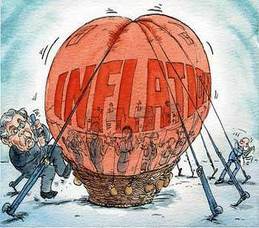 What does the market say about inflation? The market thinks that inflation will be a little under 2.0% (1.86% to be exact) for the next two years, and average almost 2.25% over the next 10 years. If the market is right, then after you factor in inflation, 2 and 5 year treasuries will in fact be yielding a NEGATIVE rate of return. This is crazy right? You’re right this is crazy. Here is a metaphor that might help. Lets say you have a pile of gold. You don’t like any of the investment options available to you. What are you to do? Find a safe place to put the gold. Its going to cost you some money to keep your gold in a nice big strong safe, but you would rather pay the money for your gold to be safe than to have someone rob you of your gold. US Treasuries have become that big strong safe. How does the market predict inflation? Its called the break even rate. In simple terms, you take the treasury yield and subtract the yield of Treasury Inflation Protected Securities (TIPS) with the corresponding maturity. The value of a TIPS moves up and down with the Consumer Price Index, a measure of inflation. This math provides you with an implied rate of inflation. Since the beginning of January, the implied rate of inflation for the next two years has been steadily rising, from around 1.55% to 2.09%. In the last few days, it come down a bit. But based on the implied rate of inflation, your return on the 2 Year treasury is currently negative 1.58%. The real rate of return over 5 years is also negative (assuming the market is correct) for both treasuries and corporate bonds. Only when you get to 10 year maturities does the real return turn positive.